In June 2013, Lincolnshire County Council announced a consultation exercise about the future of the library service. They planned to save £2 million by drastically reducing the library service. This consultation included- a series of meetings round the county BUT they were not held where libraries were shutting, they were held at odd times, people had to apply to attend and they were facilitated round – table discussions at which it was made clear that the conversation was to be about the best way of carrying out the plan and not the plan itself – a consultation document which stated that people could not comment on the planned closures. Respondents were invited to comment on the best way to carry out the Council’s plan. • to cut opening hours for nearly all the remaining 15 libraries. And NOT on the plan itself. • cuts in hours for nearly all the remaining libraries, including reducing the only library left in the university city of Lincoln to 50 hours a week. How have Lincolnshire people reacted? • and because the council’s constitution meant that the decision was taken by only 9 councillors the fight was taken to the heart of government by a busload of Lincolnshire people. Go to this page to find out about this hugely successful event: https://savelincslibraries.org.uk/2014/04/10/lobby4libraries-the-big-update/. Melvyn Bragg, Neil Gaiman, Terry Pratchett, Ian Rankin, Michael Morpurgo, Margaret Attwood, Malorie Blackman (Children’s Laureate), Michael Rosen (former Children’s Laureate) and William Hussey are among many authors who have expressed support for the campaign (from detailed messages of support to RTs on Twitter) to keep our libraries as they are, as has actor Minnie Driver. They are joined by national library campaigner groups such as Voices for the Library and The Library Campaign who have also shown strong support for the Lincolnshire campaign. 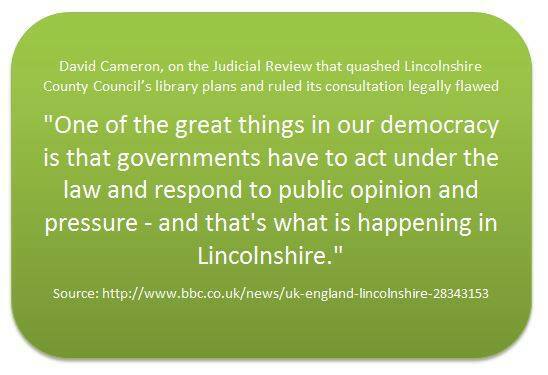 How has Lincolnshire County Council indicated that it is listening? A local resident has instigated a Judicial Review. A judge has agreed that this should be heard in the High Court on all four counts. This will take place July 8-9th. • the future library service would not be ‘comprehensive and efficient’ as required by the 1964 Act of Parliament. Lincolnshire County Council has published its plans to implement its unlawful decision in December 2013 to close thirty libraries unless volunteers take them over. This not only ignores the High Court judgement in July last year that quashed this decision but also the Localism Act which gives charities and social enterprises opportunities to run local services. A number of good ideas have come forward both before and after 3rd December 2013 on how the libraries can be better run, can have an improved book supply, can be better value for Lincolnshire and at the same time ensure that libraries remain open with professional and paid staff supported by volunteers. All of these have been ignored by the County Council. The six months since the decision in the High Court to quash the Council Decision to close 30 Libraries has been completely misused by the Council. Huge amounts of officer time and the efforts of organisations like SLL and other individuals, who genuinely wanted to improve things, have been completely wasted. What the political administration has done is to go through the motions of appearing to consider alternatives while trying to find a way to implement its destructive decision – which was taken before the whole consultation farce started in June 2013. The leading politicians have deceived the people of Lincolnshire into thinking that they could influence anything. They have wasted huge amounts of public money trying to cover their tracks. It has been an astonishing misuse of political power. Not only that, to carry on with cutting the library service would be a totally false economy with an adverse effect on other aspects of the council’s remit. Education standards will fall and older people will find their quality of life reduced which will impact on health and social care. Libraries are a golden thread that runs through the life of the whole community. When are we going to have politicians in charge in Lincolnshire who are prepared to stand up for ordinary people and the public services that they value? Why can’t the current administration hear what thousands of people across the county have been saying for 18 months now – that actually they value libraries and want them run by professional and paid staff for the benefit of local people? Spokesperson for SLL, Julie Harrison says, “Throughout this process, SLL has always highlighted the value of public libraries. We SAY NO to all cuts to our vital library services. We are holding public meetings and protests; no pre-booking required! Lincolnshire County Council are proposing massive cuts to public library services in Lincolnshire. The Save Lincolnshire Libraries campaign has been set up to protest against these destructive changes, and to make the case for public libraries in the county. The council want to remove funding from of all but 15 of the county’s 44 public libraries, and to cut 170 library jobs. If they get their way, huge areas of Lincolnshire will be left without a professionally-run library service. 29 libraries will close unless volunteers agree to run them for free. Library opening hours will be reduced even in larger towns like Horncastle and Market Rasen. Hundreds of places in Lincolnshire could lose their regular visits from the mobile library. School library budgets will be cut to zero. PC access in libraries will be reduced, just as more and more people need to access services online. Like all councils, Lincolnshire has a statutory obligation to provide a “comprehensive and efficient” library service (Public Libraries and Museums Act 1964). We believe that these cuts would leave the county without a comprehensive service, and that the most deprived rural & coastal areas of Lincs would be hardest hit. Libraries provide access to all sorts of information and support – it’s not just books! Book loans may have decreased from their peak, but people are still visiting and using libraries. 17 people every second use library services in the UK. Libraries are particularly important to families with young children, pensioners, jobseekers, and foreign migrants learning English so that they can integrate into British society. There are particular problems in Lincolnshire with “hidden” poverty and social exclusion in isolated rural & coastal areas. Library cuts will only make this situation worse. Increasingly, people can only access services online (e.g. job applications, government information and services) – there’s no other way to get this information if you’re one of the ten million people in the UK without access to the internet at home. We’re not anti-volunteering! Volunteers and community groups can bring enthusiasm and passion to local libraries, but professionally-managed services ensure quality and equality for all library users, including the most vulnerable people in society.